Helen Callanan, the end of life doula. Helen Callanan has been working with people approaching the end of their life for over 30 years. What’s one of the major things she’s learned from all her experience? How to live. Hosted by the Melbourne design studio Portable, the death dinner was part of a 13-month R&D project into the future of death and ageing in Australia. The studio had already put on very successful death drinks, asking Melbournians to take a moment to have a beer while designing their own deaths. So on a chilly August night, and over three courses, I sat and listened to everyone from product designers to artists to those working for the State Government talk through potential future issues. It was here, amongst the chatter of cemeteries, aged care facilities and health insurance, I was first introduced to the concept of an end-of-life doula. The idea of an end-of-life doula was so fascinating to me. While the dinner was proving to be an intriguing delve into the future of death and ageing I began to feel that all this talk of technology, products and services and governance would be of little comfort at ‘The End’. Yes, it’s wonderful that robots are able to administer medication and how soothing that we can have our ashes made into a diamond to be worn by a loved one but, really, when it comes down to the nitty gritty I’m pretty convinced we’ll all want the same thing – love and support. From a human. A mockup from Portable’s R&D project into designing your own death. “There's a silver tsunami coming." Helen delivering a seminar in Melbourne (Feb, 2019). 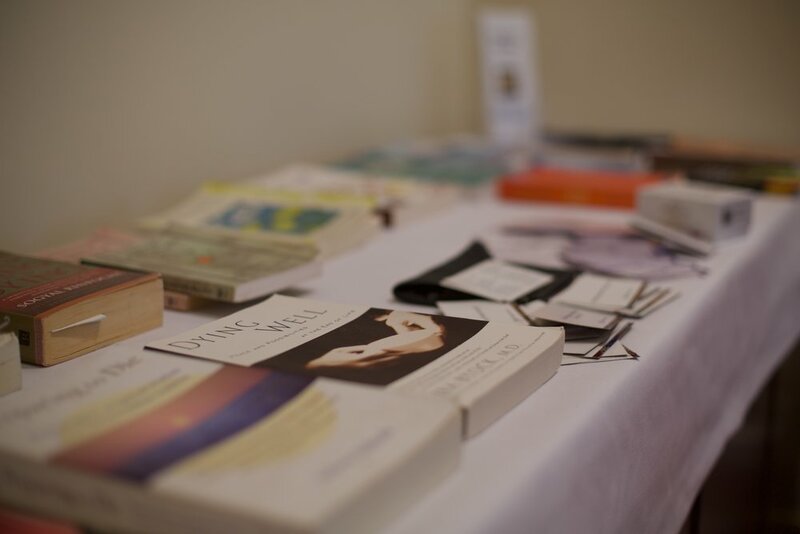 A table full of Helen’s book recommendations for dying well. “I started to think about what it would take for me to say ‘yes’ the minute death calls my name." Callanan describes the doula’s role as being less about giving out hugs and clasping of hands and more a role which provides support, education, options and resources to both the person who is dying as well as their family and those close around them. The irony is that while you, or a loved one, is in the midst of dying life doesn’t stop and wait for you to catch up, this is where a doula can help. Think of a doula as being a support system - an advocate at appointments, running errands, bringing meals and using their extended networks to source resources as well as support. Then, when someone is in the active stage of dying an end of life doula attends to their needs, giving the family a break. Her comment made me realise that I’ve been thinking about death all wrong. My focus has always been on the dying part but maybe it needs to shift more to the living side of things. A life well lived is, after all, much like those plastic tubs of Callanan’s - messy, full of crap and constantly in need of sorting out. Yet, if you’re lucky, it’s also full of adventures, stories, cringe worthy regrets and, possibly, a forgotten memory or two. Read Portable’s report on the subject of death and ageing. Find out more about Helen’s work via her website or through the Australian Doula College’s website. Whilst we’re on the topic of death, last year we featured a Melbourne-based artist that asks us to consider what it means to die, or be buried, sustainably. You might dig it. Nikki Stefanoff is a brand storyteller, journalist, copywriter and editor. She works with brands on finding their voice and telling their unique story. Nikki is also a former print editor of Matters Journal.